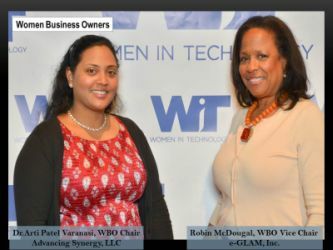 The Women Business Owners Special Interest Group (WBO SIG) offers owners of technology-related companies a confidential environment for networking, learning, and discussing business trends, ideas and solutions, specifically related to growing their businesses. Our goal is to help established and new women business owners in the Washington, DC, Maryland, and Virginia (DMV) area increase their visibility through disruptive and innovative business strategies. Our programs are designed to appeal to (but not limited to) the following technology-related fields: information technology, peripherals, software, hardware, trainers, programmers, consultants, authors, engineers, IT attorneys, intellectual property experts, project managers, health technology, devices, diagnostics, manufacturing, Six Sigma, business advisors, recruiting, counseling and coaching. Our target audience is WIT members, DMV area women business owners, start-ups, and potential start-ups. The Women Business Owners Special Interest Group offers owners of technology-related companies a confidential environment for networking, learning, and discussing business trends, ideas and solutions specifically related to growing their businesses. Our programs are designed to appeal to WBO's whose businesses are in varied stages of development. To serve as the leading organization for women business owners in the DMV (DC, Maryland and Virginia). Please visit the Event Calendar for upcoming WBO SIG events and registration information. If you are interested in serving on the Steering Committee or learning more, please contact Arti Varanasi, Chair or Robin McDougal, Vice Chair.